There’s nothing like the thrill of speaking in front of a crowd. 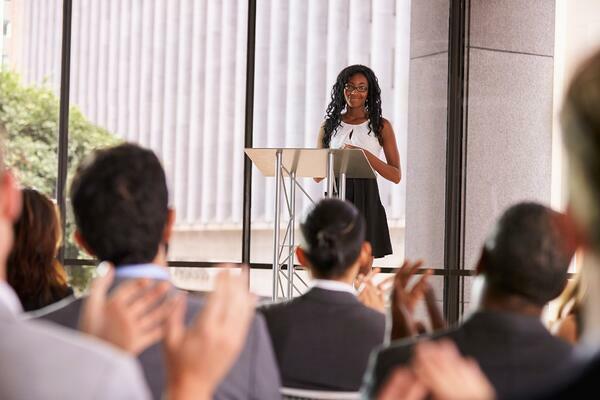 You stand before a rapt audience, sharing unique insights as the people nod thoughtfully, take careful notes and launch into a raucous ovation as you drop your mic and strut off the stage. The truth rarely lives up to reality. Regular speakers on the conference circuit know that audiences have various levels of engagement, the quality of venues is uneven and the return on investment can be difficult to track. Yet, speaking at the right events remains one of the best ways to evangelize your values, share your story and meet face-to-face with potential clients and customers. So how do you know which opportunities are the right ones? 1. Am I alone or part of a panel? Panel discussions can be lively and informative. With a variety of voices, the audiences can get a great range of opinions and perspectives. Trouble is, you are one of several voices, so it can be hard to hold your audience’s attention. Typically, solo acts are much better for your brand, since it’s all about your business and your agenda. Having said that, panels can be great, too. If you’re naturally charismatic, you may find that you shine brighter than your fellow panelists, which can be great for showing your leadership. Also, if you’re trying to represent a new or emerging brand, panels are a great way to introduce your company to an audience. 2. Do I have to pay to play? I’ve grown increasingly depressed about the production quality of most conferences. Too often, the agendas are packed with speakers who didn’t earn their place on stage but rather bought their way in. Those Platinum-sponsorship checks can go a long way. I was once at a conference where a Nobel-prize-winning economist was followed up by a head of eastern-region sales for a tech company. Nowadays, many conferences require some kind of sponsorship level to speak. Just remember that the audience probably knows that and it may cloud how they view your presentation. 3. Is the audience right? It is an absolute waste of your time and resources to speak in front of an audience where the vast majority of people in that room can’t somehow write a check for what you’re selling. 4. What time am I speaking? Pick your spots on the agenda. You never want to be the first speaker early in the morning, or the last speaker before cocktail hour. Additionally, panel discussions in the last session of a conference are the least attended, with most people headed off to the airport. Here’s a trick: If asked to speak, find out when the core keynote speakers are presenting and try to be booked around those. Generally, audiences are more engaged around those times. 5. Will the talk be recorded? Want to know why TED Talks are so popular? It’s not just because they are insightful. It’s because they are well-produced and designed for distribution beyond the folks sitting in the room. They are not so much speeches as digital assets for the speaker. If you have the opportunity to speak, try to insist the appearance is recorded and secure the rights to use it for your own marketing. A 40-minute speech can be cut into several smaller video snippets that can populate your site and be socialized. That increases your potential audience exponentially. Remember: Video is one of the most effective tools across your marketing funnel. Bad speeches and bad media appearances share one important thing in common: a lack of preparation. There is nothing more uncomfortable than someone who is clearly nervous, disengaged or unprepared. I once watched a speaker talk over a set of slides that had clearly come from another speaker’s presentation and he didn’t notice until about a third of the way through. While we laughed about it afterwards, it left the audience with the impression that this particular thought leader was lacking in original thoughts. Before you even agree to speak, make sure that you are confident enough to speak in front of groups and knowledgeable enough about the topics. Get some formal training. Do run-throughs. You are your material. Otherwise, rather than helping your brand, your speech could send audiences – and customers – heading for the exits.